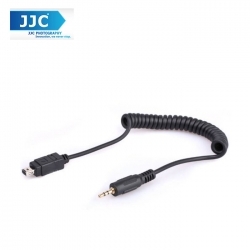 JJC Shutter Release Cable-M Compatible with Shutter Release model : 2,5mm socket This cable allows you to connect miscellaneous JJC remote controls to the remote socket of compatible cameras. The cords fits for the HR remote handle grip as well as for JR series and MET series remote controls. But it does not fit for JJC JM series devices Compatibility: D90 D 3100 D 3200 D 5000 D 5100 D 7000 D 610 D 7100 D 5300 Mentioned above to connect to the JJC timer remote release socket of the camera. Ideal as a replacement or removable cable to different types of cameras with and to operate the same trigger. Also suitable for many trigger foreign models.